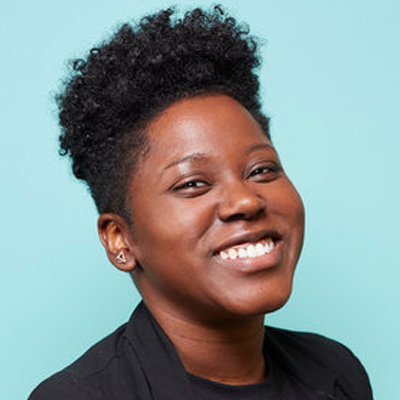 De Nichols is a St. Louis-based social practice designer, entrepreneur, and keynote lecturer who mobilizes global changemakers to design and activate ideas that address civic and social challenges within their communities. She currently serves as a Principal Designer of Civic Creatives, an impact design studio that develops interactive experiences, tools, and initiatives confronting issues of racial inequity, social division, food insecurity, and civic disengagement. As a social practice artist, De is a Citizen Artist Fellow with the John F. Kennedy Center for Performing Arts, and her works have been collected by the Smithsonian Institute’s National Museum of African American History and Culture. She lectures nationwide on subjects related to community-based design practice and teaches “Design As a Catalyst for Change” at the Sam Fox School of Design, featuring fellow changemaking designers. Since I was young, I’ve always been at that intersection of creativity, community, and social change. Growing up in rural Mississippi I was bullied a lot, and I was very conscious of racism and prejudice. In elementary and middle school a lot of my drawing and painting was about transforming the narrative of how I felt, and how I witnessed others feeling. Similarly, a lot of my work in high school and college dealt with using art as a way of presenting back what people who were marginalized were feeling. During those early years, I was also a student organizer for a lot of diversity and inclusion initiatives. So, what I do now is just a maturation of something that was always there. I started off in fine arts. Then, when I was an undergrad, I chose to major in communications design, learning how to take huge bodies of information and make them visually digestible and understandable. I wanted to take social causes and nebulous ideas and spread them across different media and platforms. After I graduated from college I found myself in a design fellowship that transformed the way that I wanted to do my work as a designer. It’s called Project M Lab and is headed up by John Bielenberg, a huge leader in the design field. The premise of Project M Lab is to teach designers how to “think wrong” in order to do good, meaning think outside of the present paradigm in order to innovate new ideas. I learned a lot from that experience. But with the context of being in rural America, being the only person of color on my team, one of two women, and the only person who had actually lived in poverty, I had a lot of issues with how I was engaging with the community. That’s what drove me to go back to grad school for social work. I’ve had to build and/or create nearly everything I’ve accomplished. When I first started as a social practice designer in 2010, there were not quite any “jobs” for the work that I now do. Even still, there are not sufficient teams or organizations that are willing and courageous enough to take full advantage of radical design practice. Many efforts still base their work on workshops, toolkits, and I’m becoming more and more of an interventionist. I find liberation as an independent artist and designer because of this as there are more entities willing to “invest in the unicorn” and my ideas than there are organizations that are ready to unlearn and unravel the paradigms of practice that leave us still suffering the same social issues. I produce works that are social interventions, unexpected experiences, and new models of possibilities. I fuse and remix parts of life that sometimes seem disconnected: FoodSpark invests in social change projects over themed dinner parties; The Mirror Casket revealed to officers the distortions of who they are when they kill others. Design Serves worked with youth of color to design civic infrastructures like a “Trash KnockOut Machine” as an alternative to dumpsters. United Story helped people divided in opinion over police brutality find commonality through story-based innovations. A lot of peers have replicated these models and integrated them into their cities and communities. Some others are creating in more radical ways as well. Still, many peers are still depending on workshops and toolkits as the sole of their work. Ideas—I’ve always been in love with ideas first. Making ideas happen and being given the liberty and luxury to work with so many people to do so is life’s greatest honor. Obedience—I believe everyone person is born with unique gifts to offer the world. It’s powerful what can manifest when we focus and live life in alignment with our spiritual calling. Proud and inspired. My mom got to experience my Visionary Award speech and was overjoyed to tears. The same happened when she visited the National Museum of African American History and Culture and knew that “her baby” had work collected there. Because of the path I’ve taken within the field, I love learning through collaboration. I’ve been fortunate to develop partnerships and speak amongst some awesome changemakers in our field and help move ideas forward. In exchange, I’ve been increasing my own skills through their wisdom and being ushered into new intersections of the field (architecture, film, ui, and ar most recently). Less ego as it relates to how we “design for good.” There are so many terms used to simply say “I use design methods to enact social change,” and it’s largely because the field is riddled with so many people want to coin their own term, be the next Tim Brown, and champion what’s next. But, I think it might cause more detriment and harm to communities if we do not more succinctly define this niche of the field, set and refine shared ethics and standards for practice, and designate some type of licensing for practitioners. As much as I believe that “everyone can be a designer,” I don’t think that everyone should be given that sense of agency or leadership when it comes to historically marginalized and vulnerable communities and demographics. I also want more non-westernized aesthetic values to become more accepted, centered, and utilized within graphic design and media-based practices. I believe that If any agency still has predominantly white and male Board, C suite, and/or Principal designers, they are missing a huge opportunity. If career pipelines do not extend to allow people of color, LGBTQ+ creators and leaders, and women-at-large to reach these levels at mass, the industry is steadily perpetuating harmful hierarchies. I will always be a designer. In 5-10 years, I will likely be orchestrating a new media agency that integrates AR and other emerging technologies even more into how we engage social issues and human interaction in public space. Don’t just copy other people’s paths or take the same steps they have. Work with deep alignment to what you feel called to create and become, and articulate that vision to the world.